Looks much like other Audis of the front. This is the 2016. Tweaked for 2017. Though unrelated mechanically, the S3 looks much like larger Audi sedans, just smaller. The dramatic CLA, marketed as a coupe, resembles the much larger CLS rather than a Mercedes sedan. The Golf R shares a powertrain and chassis with the S3, but is a hatchback and costs less. The S3's relatively short length is most evident from the side. They disguised it well. Most elegant from the rear quarter. S3 has four exhaust tips, two per side and one per cylinder. Drooping rear end. Some people like it. I don't. More obviously a high-performance model. To some people, the A3's spare interior seems cheap. The more expensive S3 has the same interior. The AMG CLA45's interior employs cheaper materials, but is more aggressively sporty. Does the S3's interior look much more upscale than the Golf R's? Cleanly styled to a fault. Round air vents as in the sporty TT. This is the 2016. 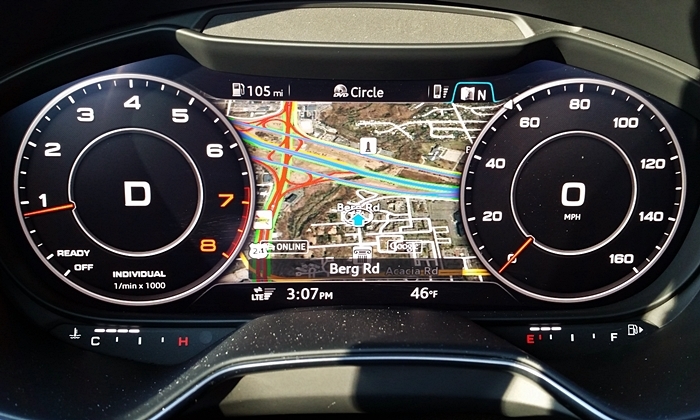 The 2017 has reconfigurable LCD instruments. The $1850 sport seats look great and provide excellent support, but delete power adjustments. Adults will fit much better back here than in the CLA. Small trunk, but usually enough.